I was just reflecting on the photos, video and blog articles from last years expedition to the frozen north and getting very excited. Grand Lake is the state's hot spot and premier ice fishing location for togue and salmon. Any flag at any moment could mean a wall hanger or a new state record fish. I will be in good hands as 3 of the 6 people in our group are registered Maine fishing guides! 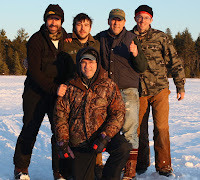 Here are a few of the photo's from last years reunion of family, friends and rabid outdoorsmen! Enjoy! Mud Trout Door Stop - Blog article and photos showcasing the many practical and impractical uses of frozen fish. The Ash Wood Pack Basket - Blog article and photos showcasing that they really don't make them like they used to. Great Catch - Video on my cousin catching a 4 foot stick and then a nice sized salmon. Big Bait Big Fish - Video of a togue literally gagging on the oversized sucker it was trying to consume.